According to a Sydney Morning Herald poll, 61% of people said they wouldn’t attend a Christmas work party without alcohol. Perhaps intoxicating liquid is the only way to make work colleagues bearable or perhaps an open bar is viewed as the chance to rectify a poor bonus payout. Statistics from the same poll also revealed that dodgy dancing is the most common theme when a congregation of misfits try to relax and have fun. Kissing a workmate and flirting with the boss run tight in silver and bronze but the most alarming statistic is that one in 50 said they had quit their job during the office party. The only thing worse would be to knot your tie around your head. Let’s try to avoid both. It may sound simple but a complete misunderstanding of the dress code could be the start of a very long night. If ‘Christmas’ is the theme; think Will Ferrell in Elf not Mean Girls’ Jingle Bell Rock. Plan an exact time to be picked up or to jump into a taxi and save embarrassing yourself in the final few hours when everyone is a little worse for wear. Nothing good happens after 2am. Fact. Roll up to the party as if it’s the Olympics. You’re an athlete entered into the marathon not the 100m sprint; so pace yourself. And remember; Flaming Sambucas, Tequila Slammers and Kamikaze’s are never a good idea. Never. If it’s a bring your own bottle job then a few Holsten 0.0’s will stop you hitting blind drunk before you’ve even seen your boss. And, if the bar doesn’t serve Holsten, well it’s not a very good venue is it. Everyone has one drink that doesn’t mix well with their emotions. If you know vodka will open up confessions to loving the secretary and rum will leave you talking utter drivel about the NRL; stick to a safer poison. Christmas work parties aren’t designed to wind up the rumour mill. It may seem difficult to hold your tongue when the juiciest gossip has squeezed its way into your path but remember you will be back in work on Monday morning. Unless you quit your job, of course. Everyone has their close work friends, those they dislike and a couple individuals they’ve never seen before. However, mingling is essential in these situations; especially if you’re looking for a pay rise. Pretty simple, but a big one. 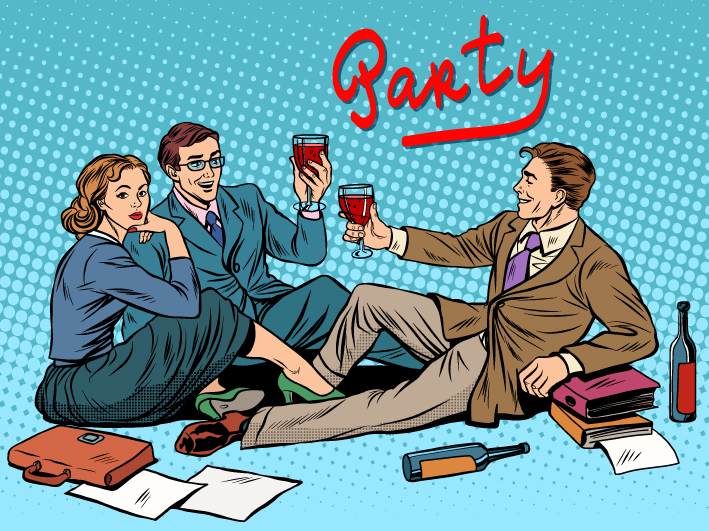 If one in 50 have admitted to quitting their job at a Christmas work party then it could happen during your shindig. Don’t be the statistic.